I’ll admit it up front: I have crossed over into the dark side. 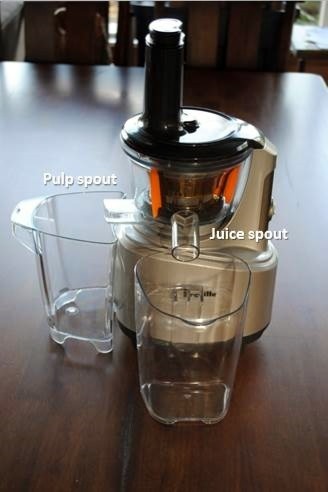 After years of making juice in my Ninja Blenders, I bought a juicer and have been making juice sans pulp. And, I have to say, it has been fan-tab-ulous. 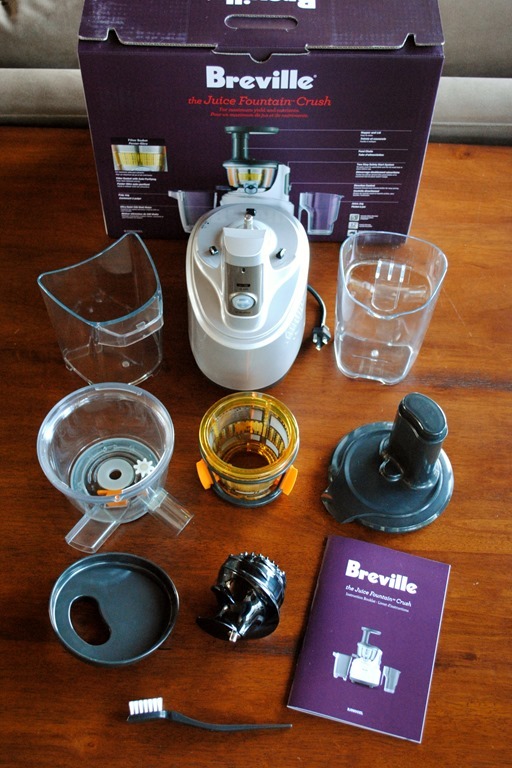 Though I had been thinking of getting a juicer for some time, I picked up the Breville Juice Fountain Crush on somewhat of a whim. 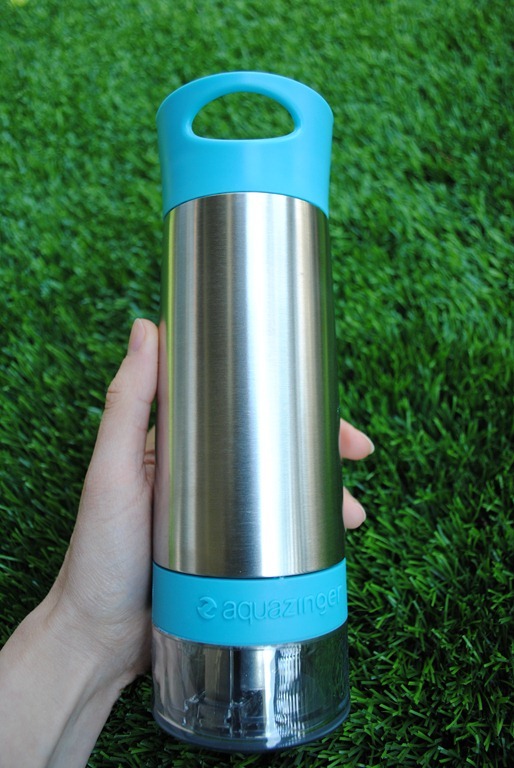 As you guys know, I am a fan of Amazon, and do pretty much all of our shopping there. My Amazon Prime membership gets well-used, and, if you are not a Prime member, I cannot recommend it enough! Free two-day shipping on most items, a huge library of video entertainment to stream for free, and, free cloud storage make it a well-worth-it luxury. Anyway, Amazon is brilliant at marketing. Its algorithms know what I like, and, it suggests things to me daily. 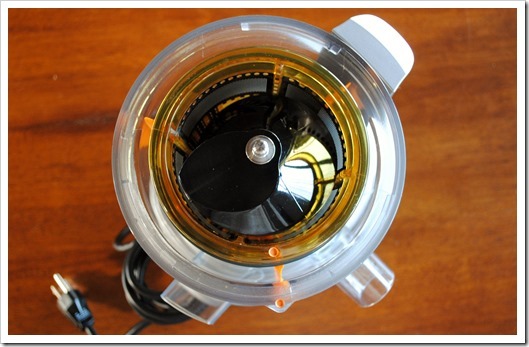 I usually ignore these suggestions, but, when I had an email that this masticating slow juicer was on sale for one day only at a ridiculously good price, I couldn’t resist. 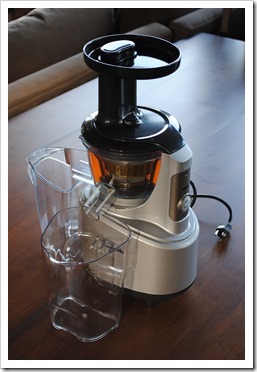 One-click later, the juicer was on its way to me. 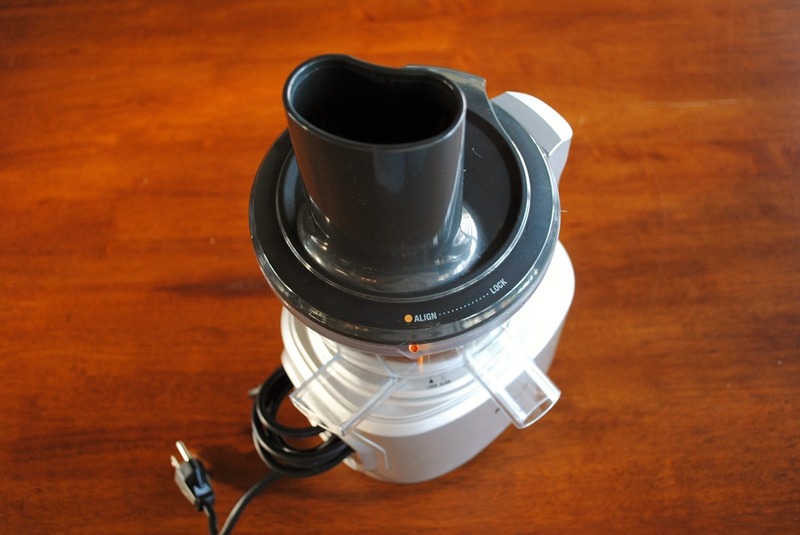 As a side note, I had been researching juicers on and off for probably a year, and had already decided that I would prefer to get a masticating slow juicer (of which the Breville Crush is one) to squeeze the most nutrition out of the produce, as well as yield the least waste. 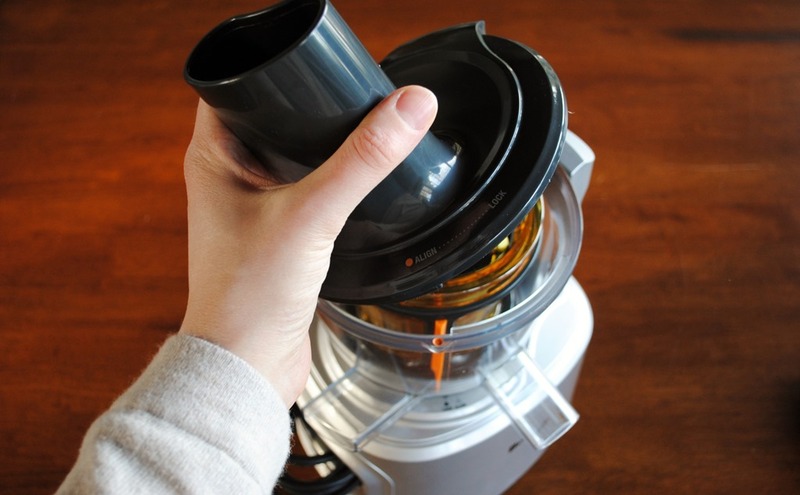 When it comes to juicers, the price point can be all over the map, from $50 for an entry level machine to upwards of $500 for a more sophisticated juicer. 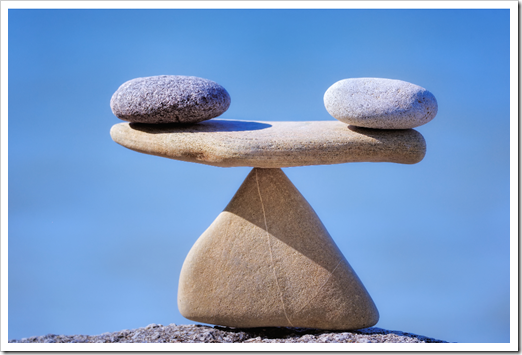 There are many types to choose from, and here is a good article explaining the different types and their benefits. 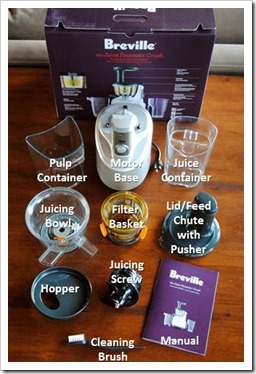 As a second side note, the Breville Crush juicer strikes me as very similar to this Omega juicer. I have no idea if that is intentional, or if there is some OEM relationship going on, but, I find the resemblance striking. 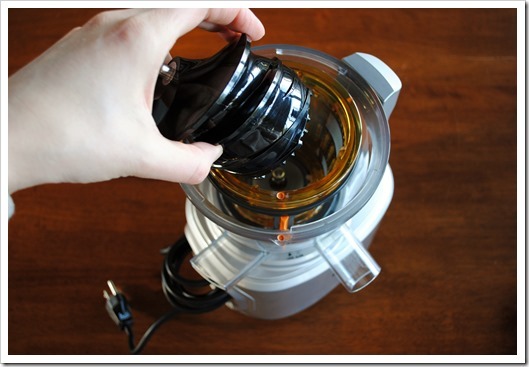 After using the juicer daily for the past two weeks or so, I’m ready to share my thoughts with you. So, as a follow up to my “get healthier” suggestion for the New Year, here’s a rundown on a great way to introduce vitamins and minerals to your diet: Juicing. 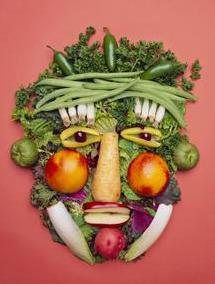 No matter where you stand on juicing, you can find someone prominent to support your thoughts. 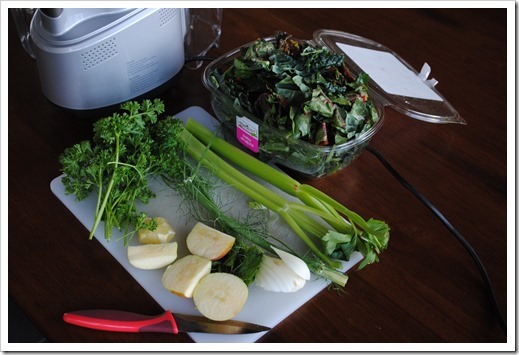 Some people are very much proponents of juicing (especially green juices), while others believe that juicing strips the fiber, and thus most of the nutrition, out of the produce and provides a concentration of sugar straight to the bloodstream. 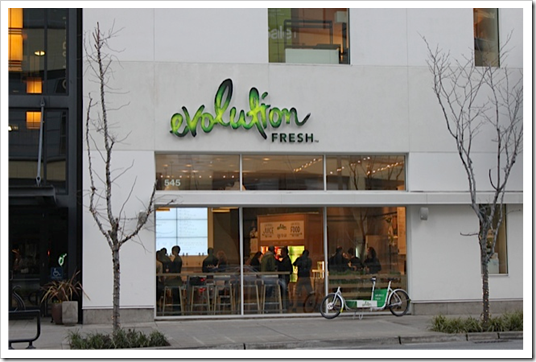 For this review, we’re going to put aside philosophical beliefs on juicing, and just talk about the actual machine at hand. 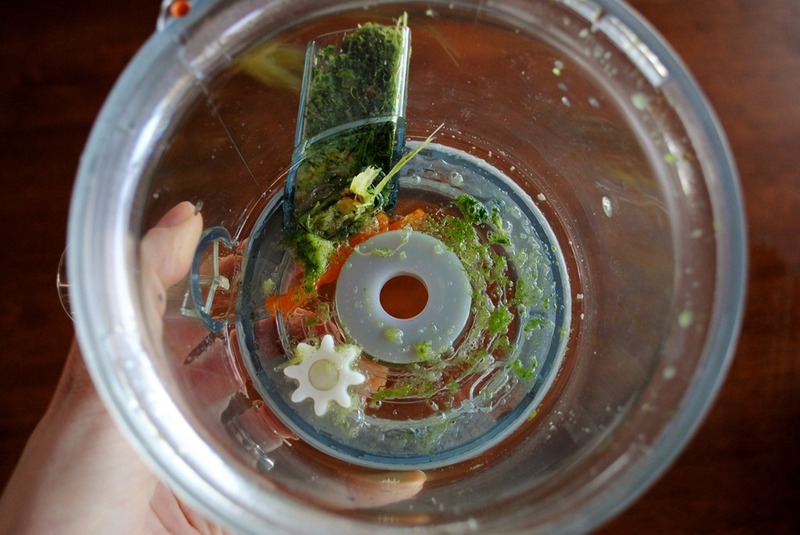 One of the reasons I’d put off buying a juicer is that I had heard that they can take up a lot of space and be difficult to clean. 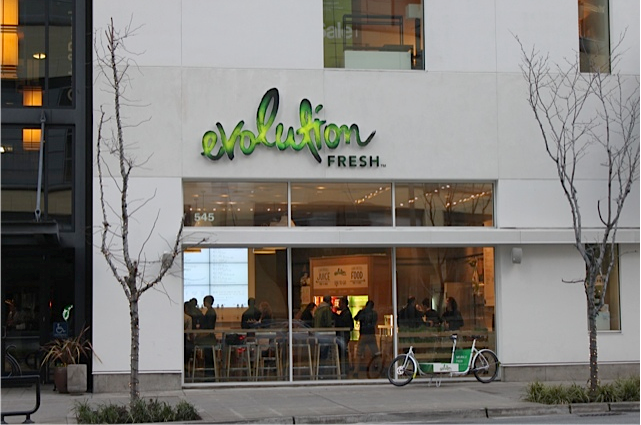 I’d been spending a pretty penny on Evolution Fresh juices ($6/16 ounces) for a while now, thinking I just didn’t have room for a juicer, nor did I want to clean up a juicer. Honestly, I was surprised by the relatively petite footprint of this machine, and cleaning it is easier than I thought, which I’ll detail a little later on in this review. Here’s what’s in the box, with explanations on the right. This looks like a lot of stuff, but, when assembled, it’s not all that much. 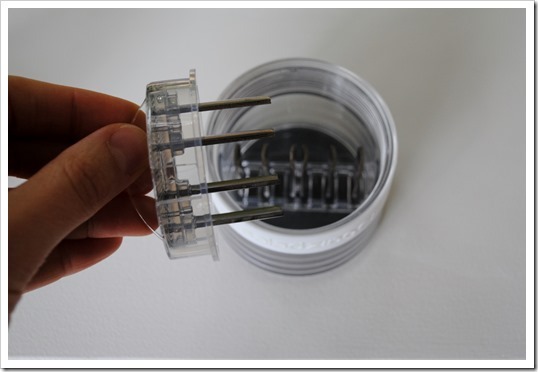 Here’s a step-by-step assembly process. 1. 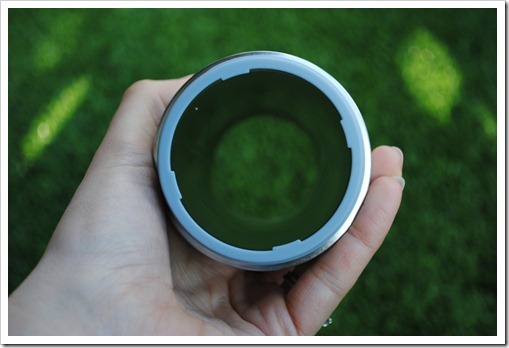 Place Juicing Bowl on the base, being careful to align the orange dot with the “Align” lettering, and then twist the bowl gently to the right to lock it in place. 2. 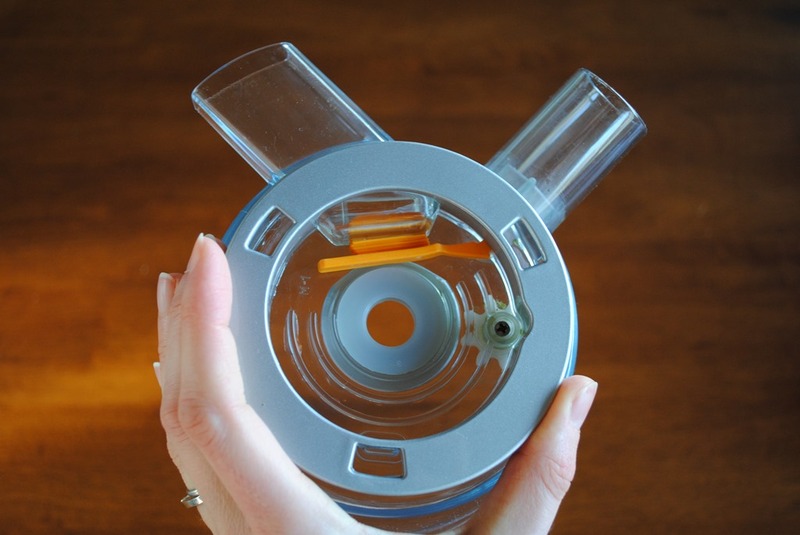 Place the Filter Basket into the Juicing Bowl by aligning the orange dot on the filter basket with the orange dot on the juicing bowl. You do not need to twist – the basket should just sit nicely in its place. 3. 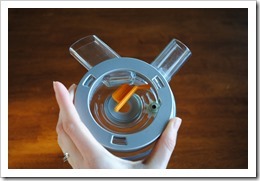 Insert the Juicing Screw. 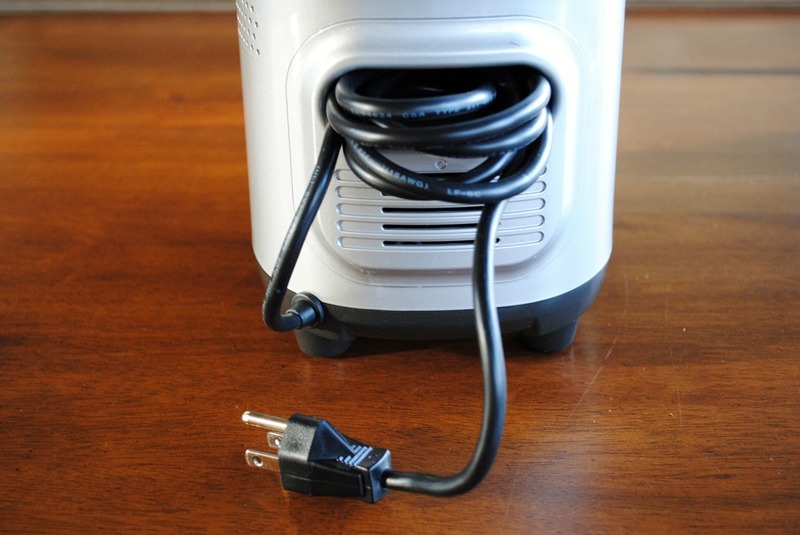 Ensure that it is in place by pressing down on it to feel it click into place. There is no real “aligning” required on this step. 4. 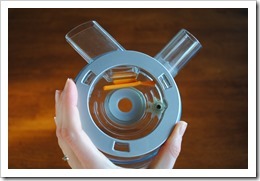 Place the Lid (feed chute) onto the Filter Bowl, aligning the orange dots, and then twisting to right to lock in place. 5. 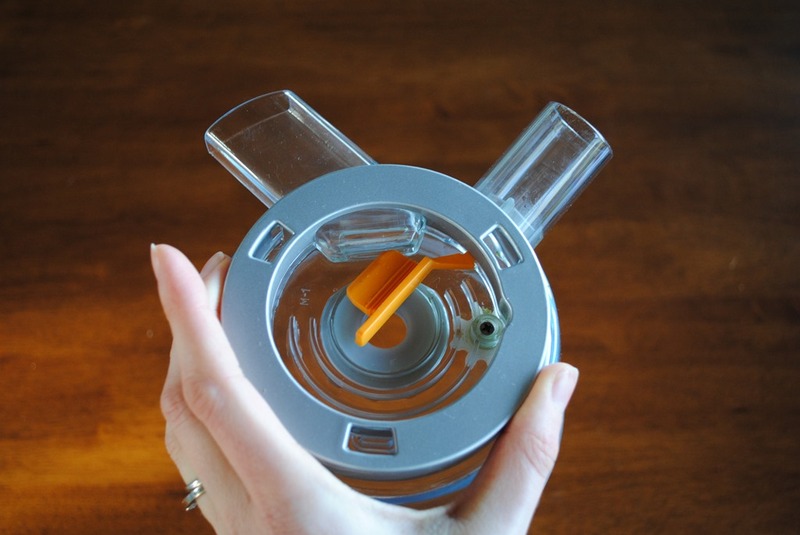 If you plan to use the Hopper, place it now, and insert the Food Pusher. 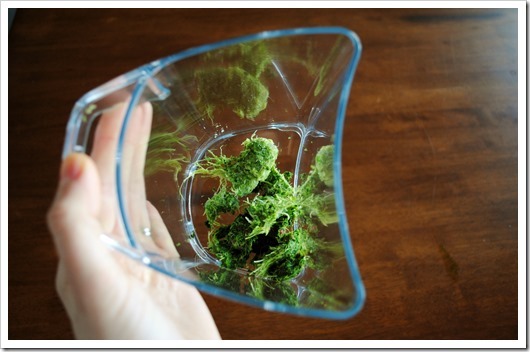 (Or, just insert the Food Pusher). 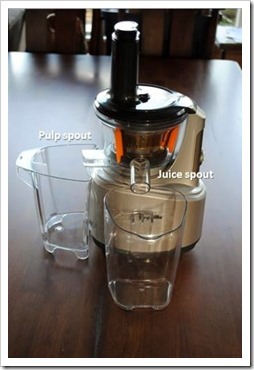 Then place the Juice Container and Pulp Container under their respective spouts. 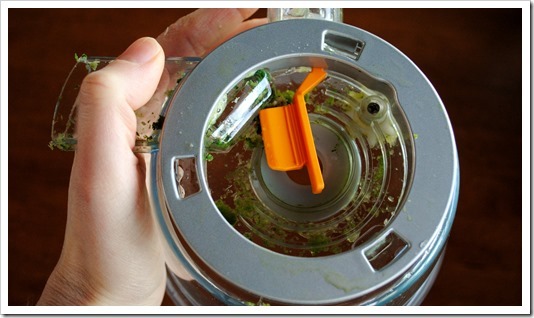 You have to tilt the juice container to fit it under the juice spout. 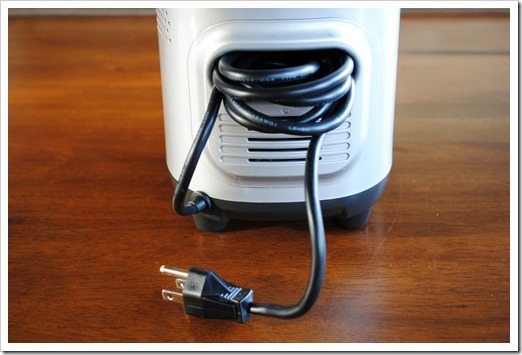 Side note: When storing, there is a nice cutaway area on the back of the base to store the extra cord. I figured what better way to show you how this machine works than to actually show you?! Here is a short video of the juice making process, from start to finish. 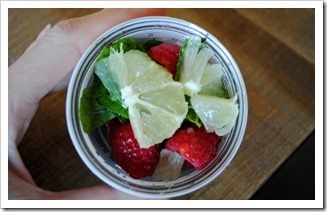 1) Prepare your produce before beginning to juice. Pick out your ingredients and have them chopped if needed, and easily accessible on your right hand side (because the juice container is on the left). 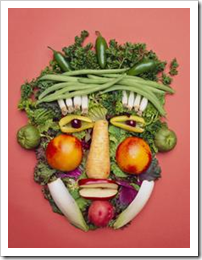 Normal food rules apply: If you wouldn’t eat it, don’t juice it. 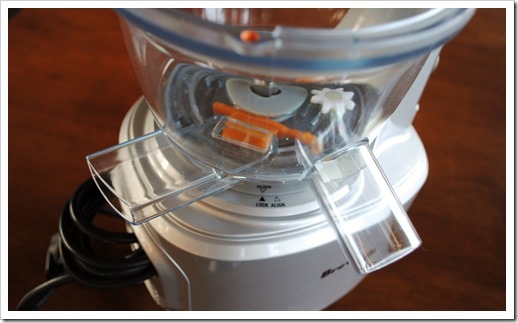 2) Turn it on before beginning to insert produce, but don’t wait more than about 20 seconds to do so. 3) Don’t push too hard on the produce. Let the machine intake it on its own power. It should feel like its just being sucked into the machine. 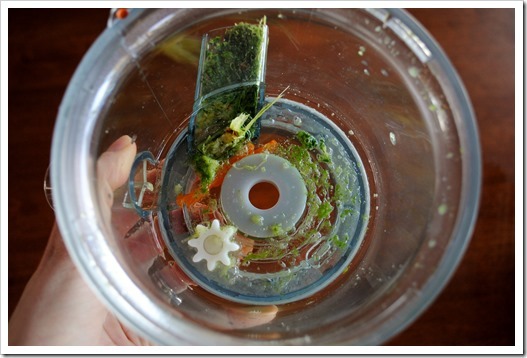 Use the pusher to send leafy greens down, but you don’t really need to push longer items like celery. If it gets jammed, use the reverse button to free the stuck produce. The only thing I have found that likes to jam is whole carrots – they are so hard that they tend to get stuck unless you chop them into chunks or cut them on the bias. 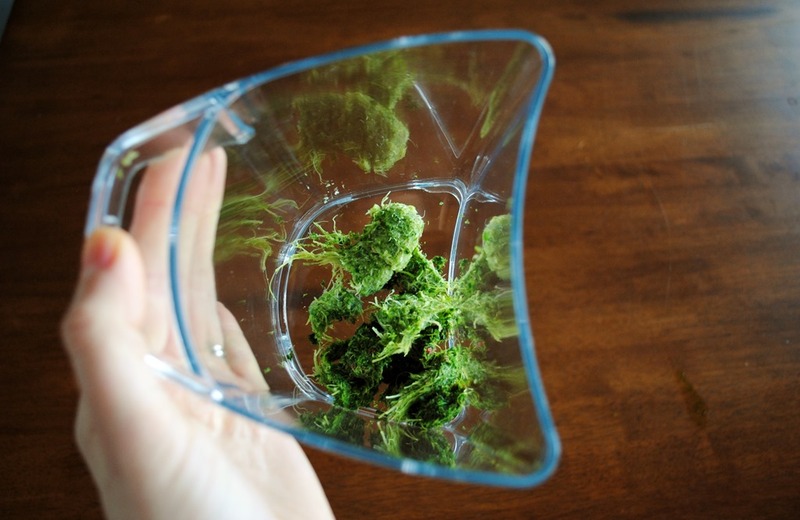 4) Insert greens and softer items first, followed by harder items like apples and carrots, as the harder produce will help push the softer produce’s pulp out of the machine. 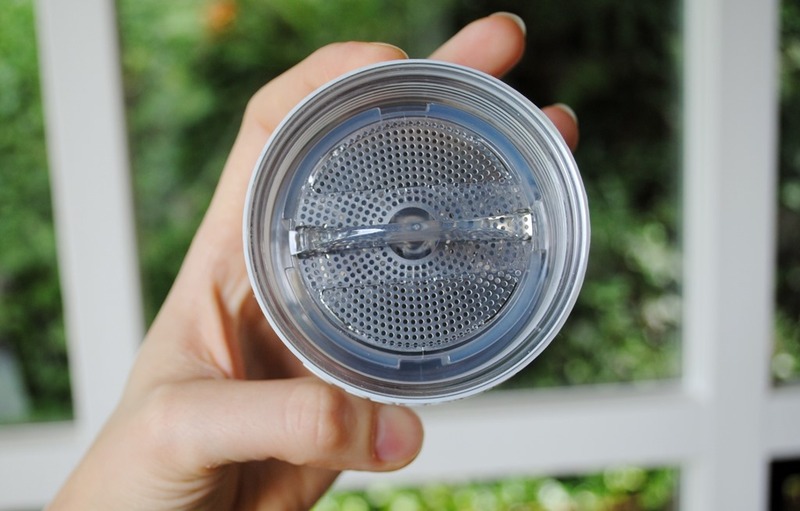 5) When you’re done, or want to switch flavors if you’re making a bunch of juice, run about 16 ounces of water through the feed chute to rinse out the pulp that is in the filter basket. 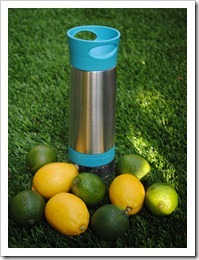 Be sure you have a container under the juice spout to catch the water. You’ll see that I didn’t really go crazy chopping anything, not even the apple. I simply cut it off its core. 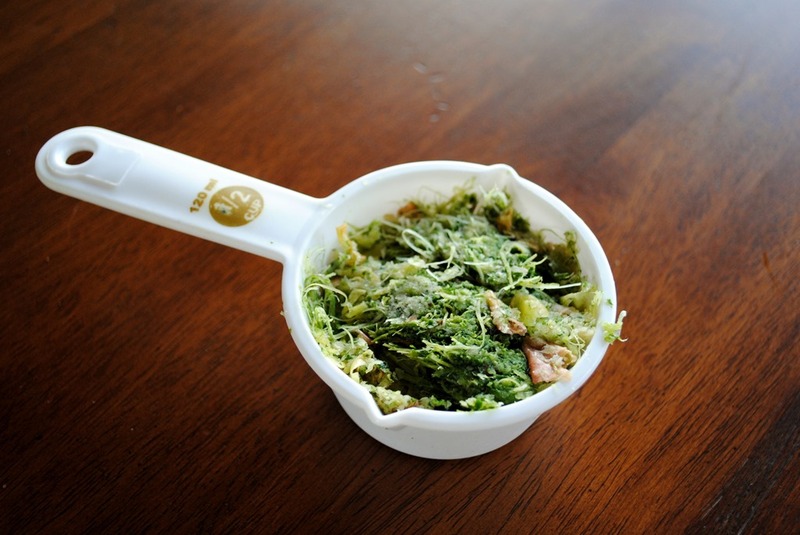 I had pre-chopped a bunch of greens into chunks, which is something I do each week after my CSA delivery comes from Spud (the container is not the actual container – I am re-using one, and I only used a few cups’ worth out of it, not the whole thing). 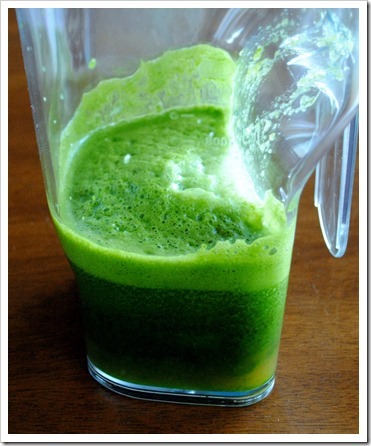 This recipe yields about 10-12 ounces of juice (depending on if you count froth) and less than 1/2 cup of very dry pulp, including the pulp that remained in the machine. I don’t know about you, but I find that pretty impressive! 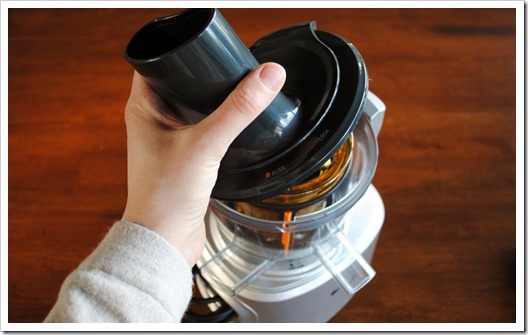 Like anything, cleaning up the juicer is much easier if you do it right away. If you leave it for a few hours, it’s infinitely harder to clean. But, if you clean up within an hour or so, it’s very easy. There are a few tricks to making this as easy as possible, so I thought I’d outline them here. 1. 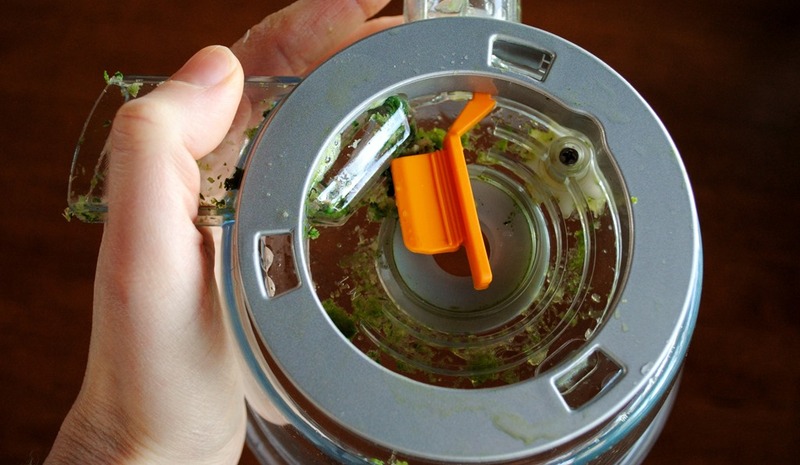 Immediately after using the juicer, the manufacturer suggests running a glass of water through it, while it is on, to help start the cleaning process. 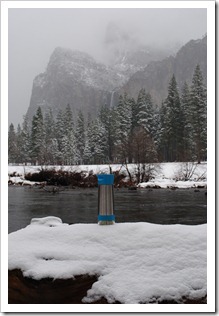 In my experience, this really does help clean out the filter basket. 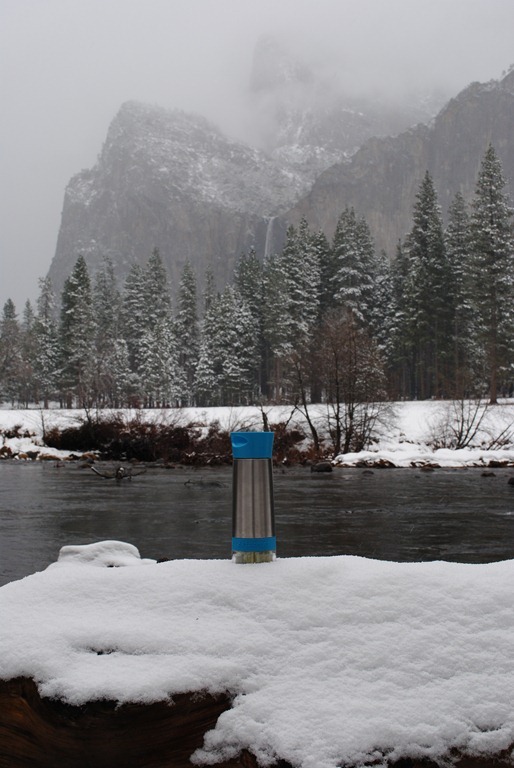 Remember to put some sort of catch basin or the juice container under the juice spout, as that is where the water will come out. 2. 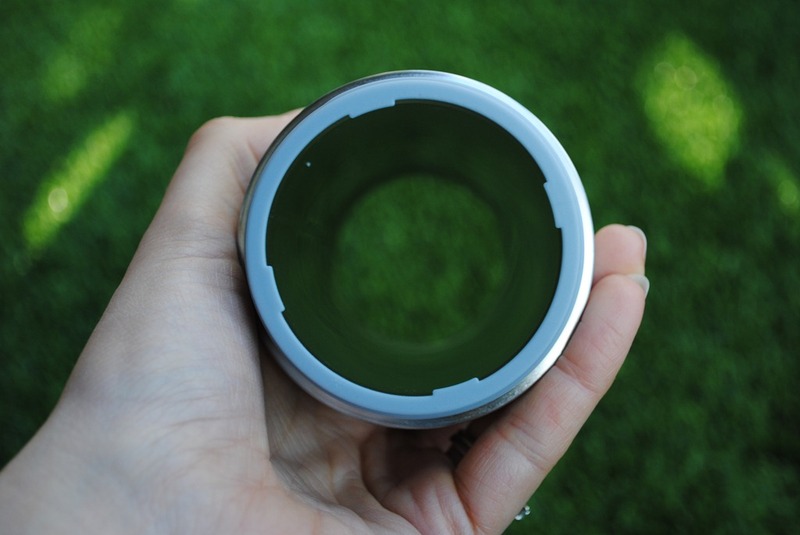 There is a rubber gasket on the bottom of the juice bowl that controls the flow of pulp into the pulp chute. 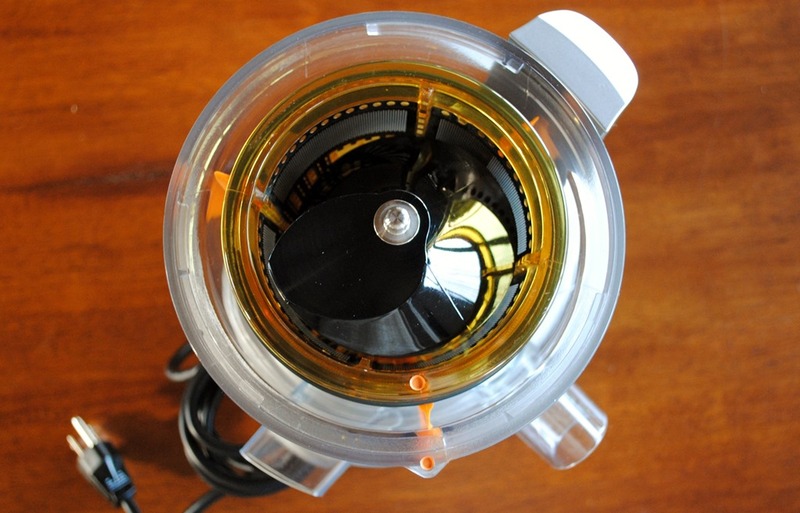 This gasket and pulp chute in general are the more difficult areas to clean, but if you use the little brush that comes with the juicer, it’s really a snap. 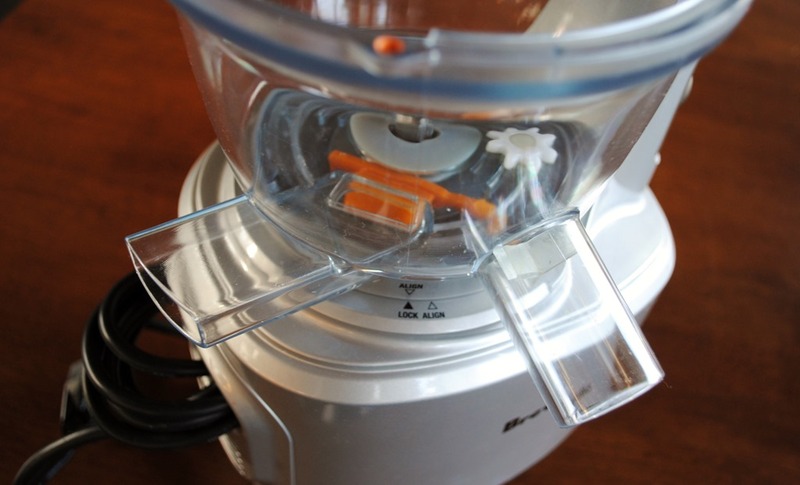 Then, unplug the orange gasket and remove any remaining pulp and wash normally, remembering to re-insert the gasket before your next use. The little grey washer type gasket also pops out if needed. 3. Use the provided brush to scrub out the filter basket, as pulp can get stuck in the screen. A quick scrub and you’re back in business. 4. 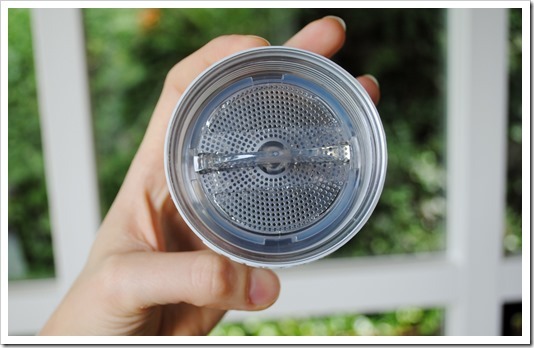 Clean all the parts with warm soapy water (do not put in the dishwasher), rinse well, and let air dry. The entire washing process takes no more than 2-3 minutes or so if you get the pulp out of the pulp shoot prior to starting to clean up. I am very happy with this juicer! It produces a lovely juice with a bit of the pulp intact, which I like. I also like the foam that results – though some people may not. I think of it kind of like the head on a nice beer or foam on a latte. 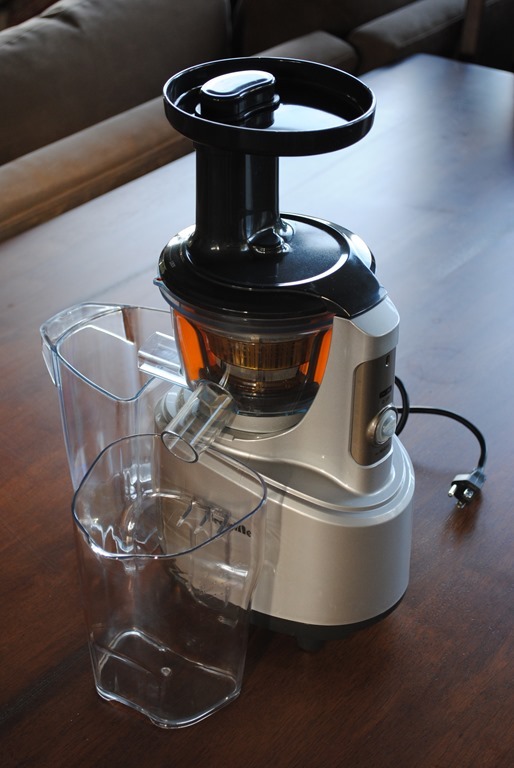 It is night and day different to make juice in a juicer than a blender, but, the end products also serve different purposes. 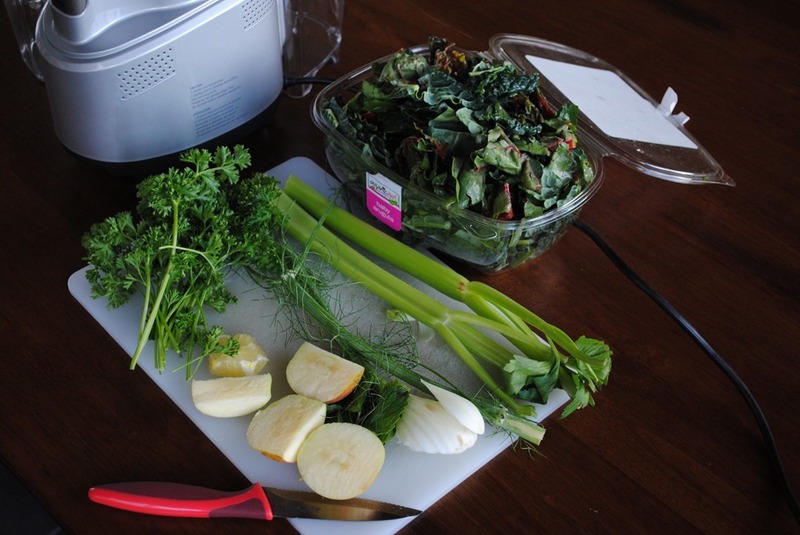 If you’re a “I want all the pulp and fiber type,” then juicing with something like a Ninja Blender is the way to go. 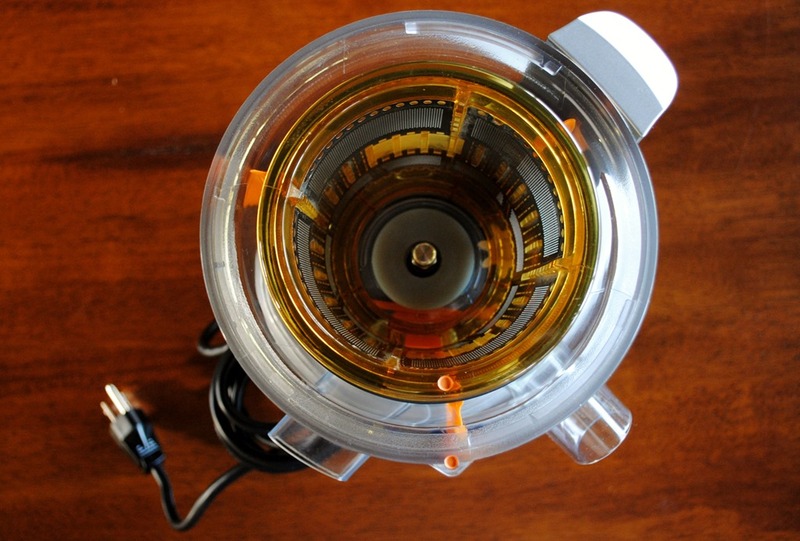 If you only make juice that you strain after blending, then, a juicer is probably the way to go. 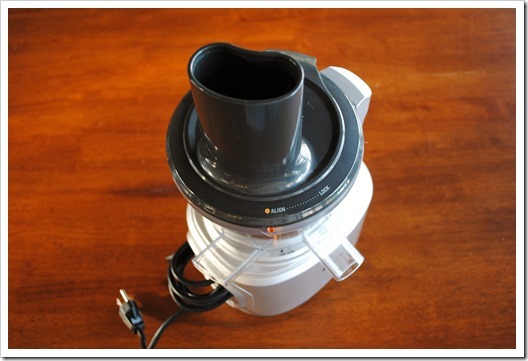 One very big difference between this juicer and a blender is that the juicer is very quiet to operate. It’s amazingly quiet, in fact. 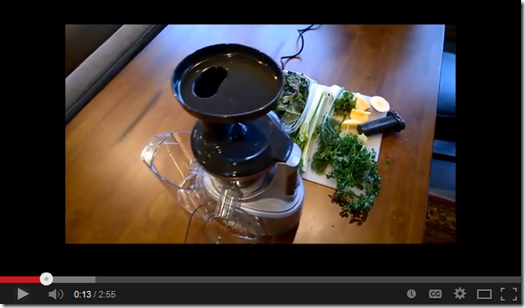 I didn’t alter the audio in the above video, so you can hear exactly how it sounds when juicing. Here is my initial pros and cons list, which you’ll find slanted to the “pros” side, as I really can’t find much negative to say about this machine. I truly cannot think of any others! 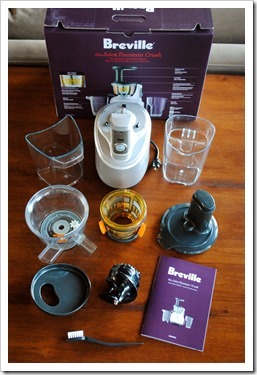 This Breville Crush slow juicer has proven to be very easy to use and clean up – I’m sold. 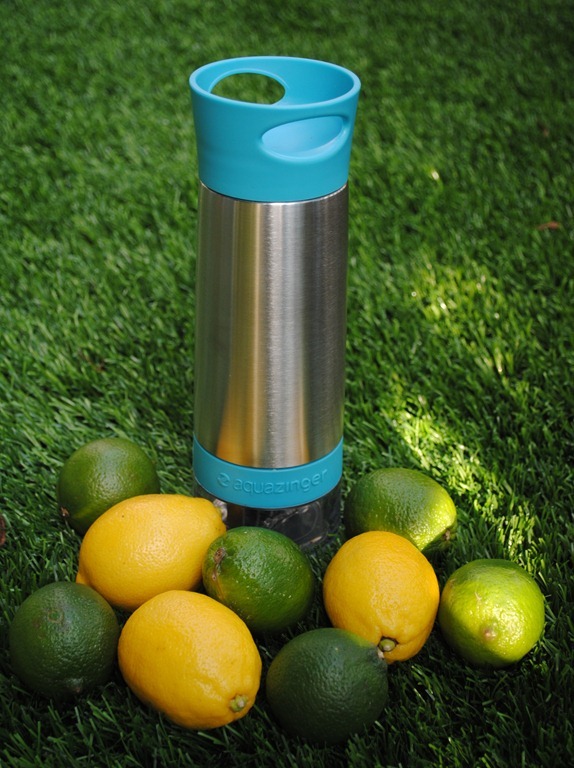 I won’t be buying any store-bought juice any longer – so long $6/bottle juices! I hope you found this review helpful. If you have questions that I didn’t answer, please leave them in the comments and I’ll do my best to answer them for you. 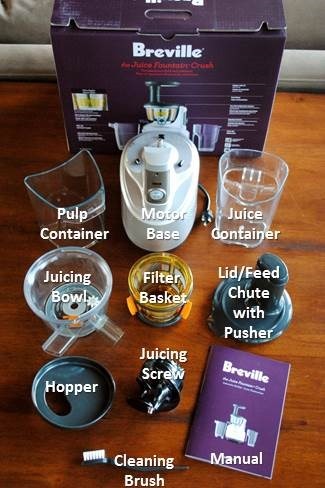 And as always, if you decide to buy a Breville Juice Fountain Crush (or any other juicer or product) from Amazon, doing so via this link helps support the site at no cost to you. Thanks for reading! 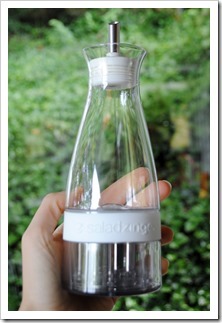 A few weeks ago, the kind folks at Zing Anything sent me a Salad Zinger to review. 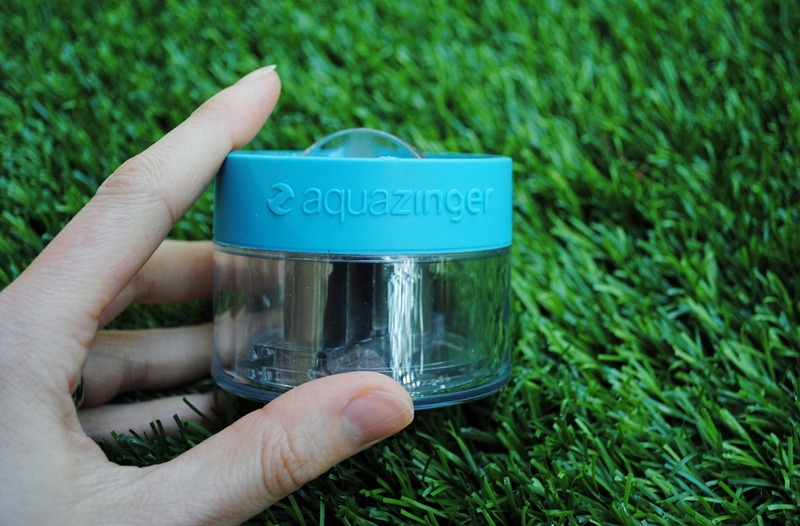 You might remember Zing Anything from the Aqua Zinger, which I absolutely love. 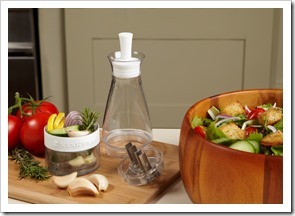 A stylish salad dressing cruet with a unique base that allows for grinding of fresh fruits, veggies, and herbs, to add a distinctive infused flavor into your creations. Also included are a user guide and brief recipe leaflet. The current retail price is $25. 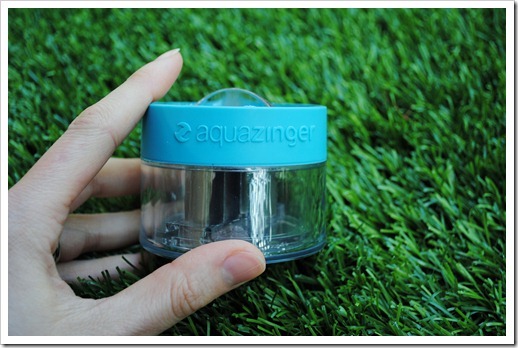 The Salad Zinger is similar to the Aqua Zinger in he design of the “grinder” at the bottom of the bottle. 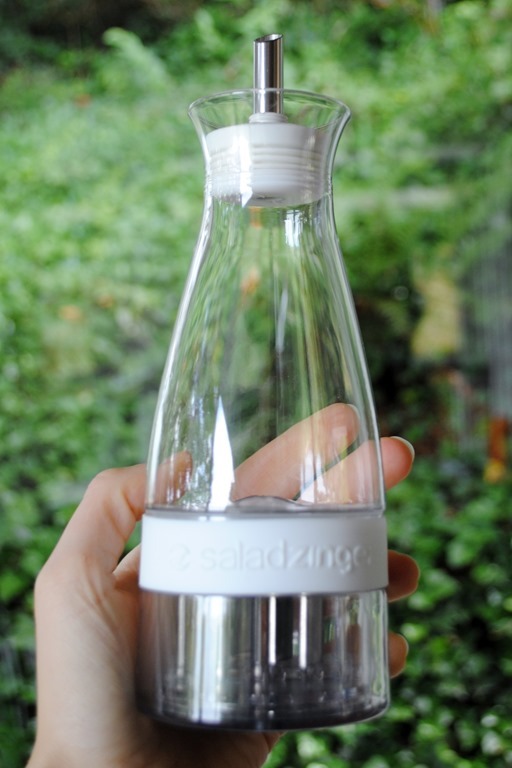 The difference is that the Salad Zinger is designed to allow for easy creating of salad dressings with a drip-free spout and BPA-free plastic bottle. 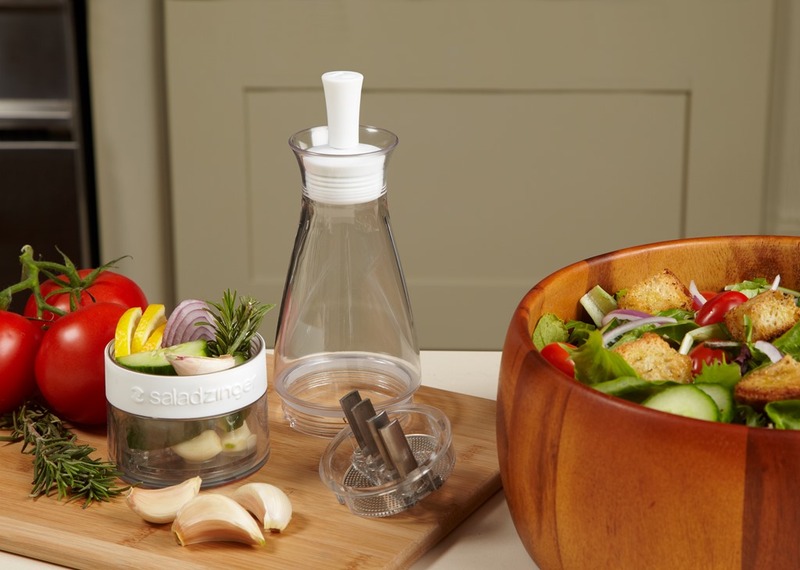 In a nutshell, you put the items you want to infuse into the grinder base of the Salad Zinger, and as you screw the base onto the cruet, it grinds the fresh ingredients and enables infusing of the flavors with the oil and vinegar you have poured into the cruet. 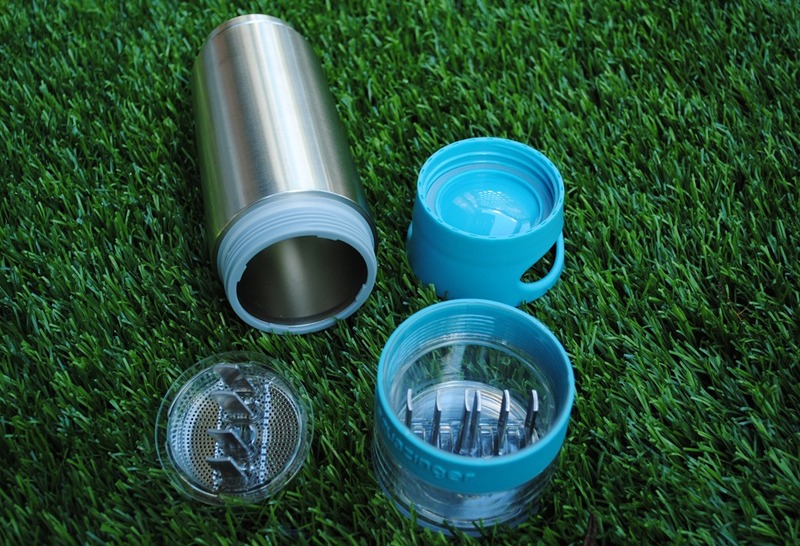 Probably the most important feature of the Salad Zinger is that its plastic parts are BPA/EA-free Tritan plastic. To be honest, it would be nice if the cruet was made of glass for long term durability, but I can se how that might be heavy and also potentially dangerous from a breakage perspective. 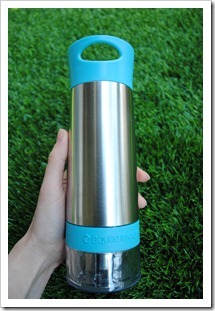 The spout and blades are food grade safe stainless steel. 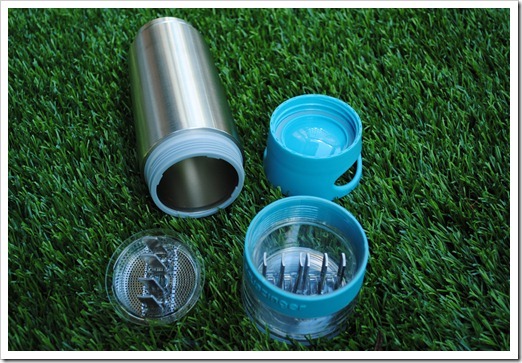 The base of the grinder cup has a rubber base pad to prevent slippage, and, there is a silicon cap to cover the spout during storage. 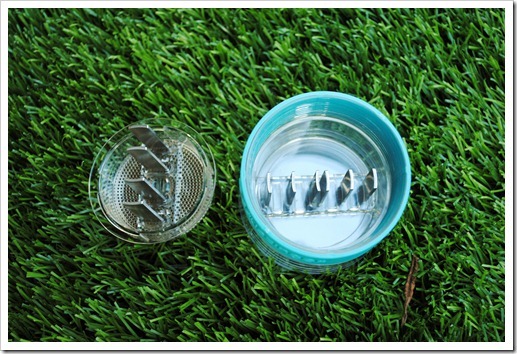 The grinder base is very similar to that of the Aqua Zinger, with metal grinding blades to cut through the ingredients you are grinding. 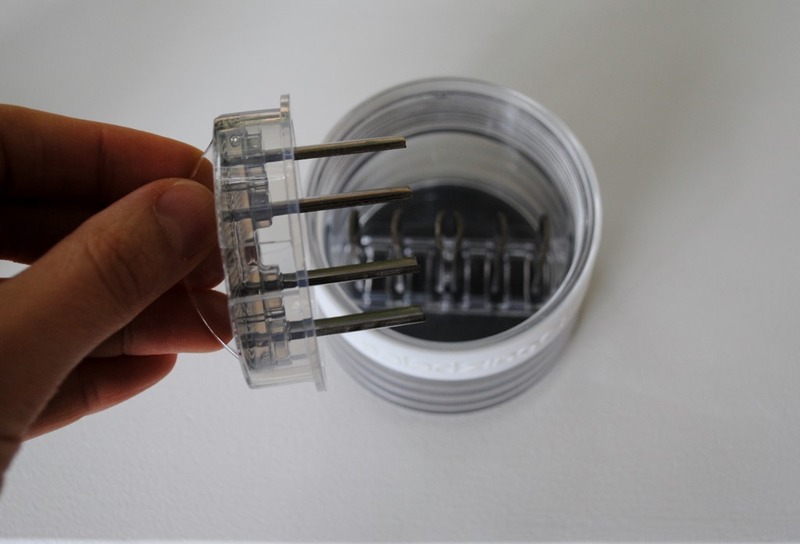 The blades are not sharp like a knife, so you don’t have to worry about slicing your fingers. 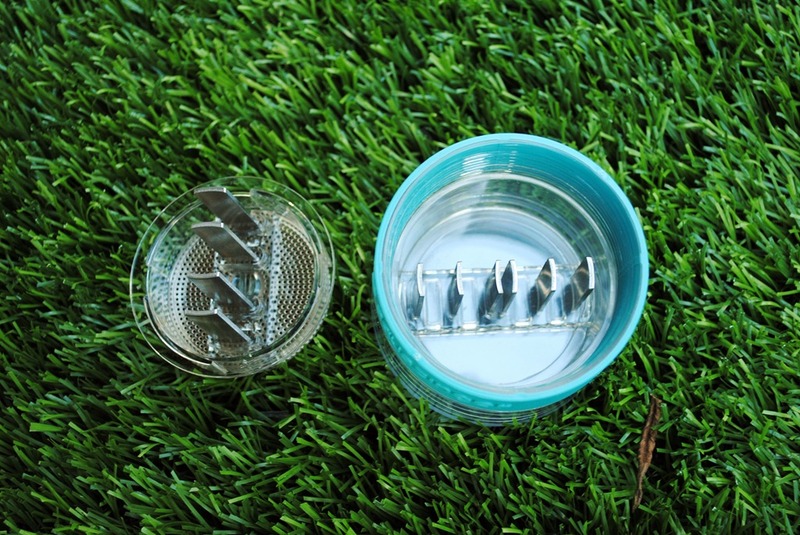 The grinder top is perforated to allow the flavors to infuse back and forth. This is where the sky is the limit. I am notorious for making only this simple balsamic vinaigrette – it’s my staple dressing (or as 2Chili calls it, “sauce”) and I like it. But, there are so many other wonderful dressings that could be made, and thankfully the Salad Zinger comes with a recipe booklet to help fire up your creative juices. 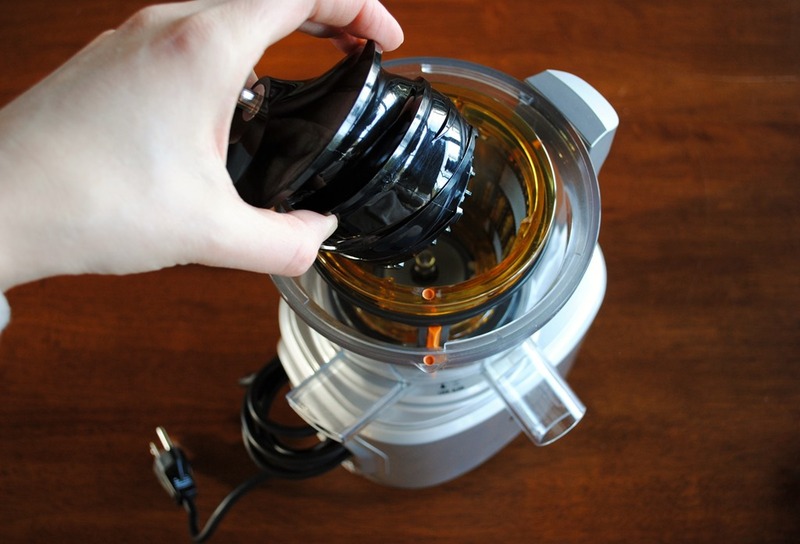 In addition to salad dressings, you can also make infused oil, which is a special treat! 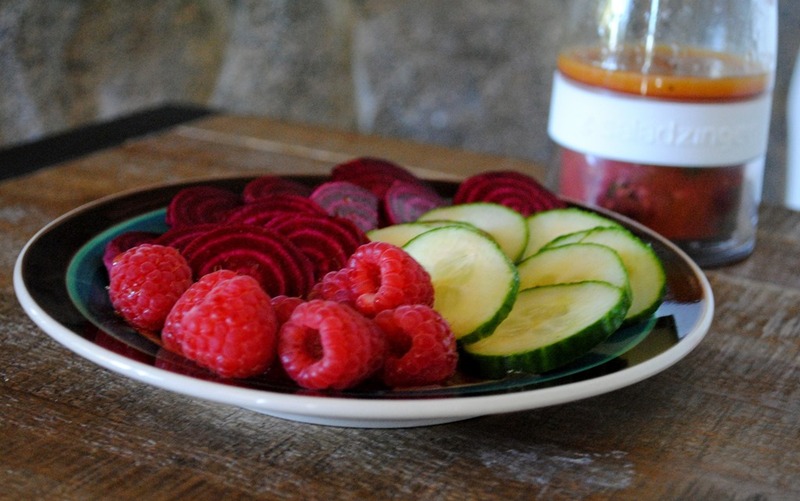 The chef’s suggestion was to serve over thinly sliced beets, and I have to say, it was quite tasty with beets, cucumbers and raspberries. You can get more recipes on the Zing Anything website, here. The guidance is to store your creations in the fridge for no more than five days, which is sound advice, regardless of if you use a Salad Zinger or not. 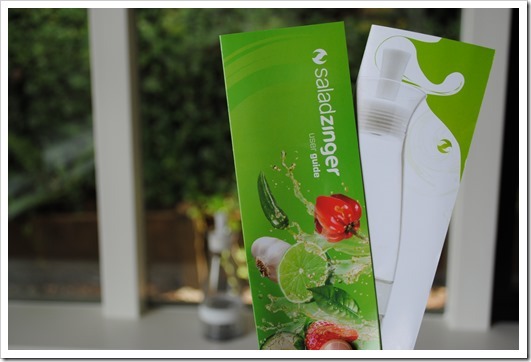 Do you NEED a Salad Zinger? Honestly, I’d say it’s kind of an affordable luxury item. If you eat a lot of salads (and, we all really should), it provides a simple way to get creative with your dressings while also providing an attractive serving vessel. It really is fun to infuse the dressings, and clean up of the Salad Zinger is very easy. 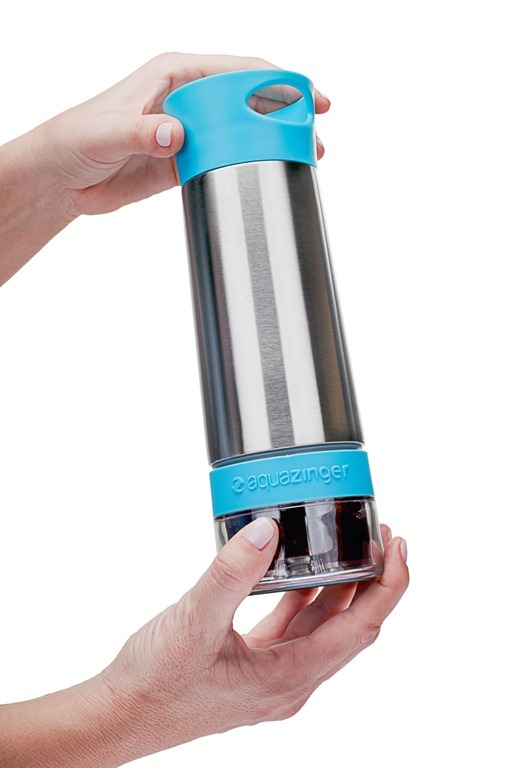 The Salad Zinger is top shelf dishwasher safe, or, you can do like I do and hand wash. Someday we’ll have a dishwasher again! 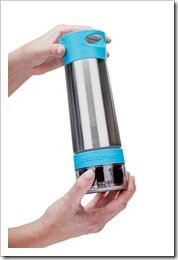 I am super happy to have one, and see this as a kitchen gadget that will get used a lot in our house. 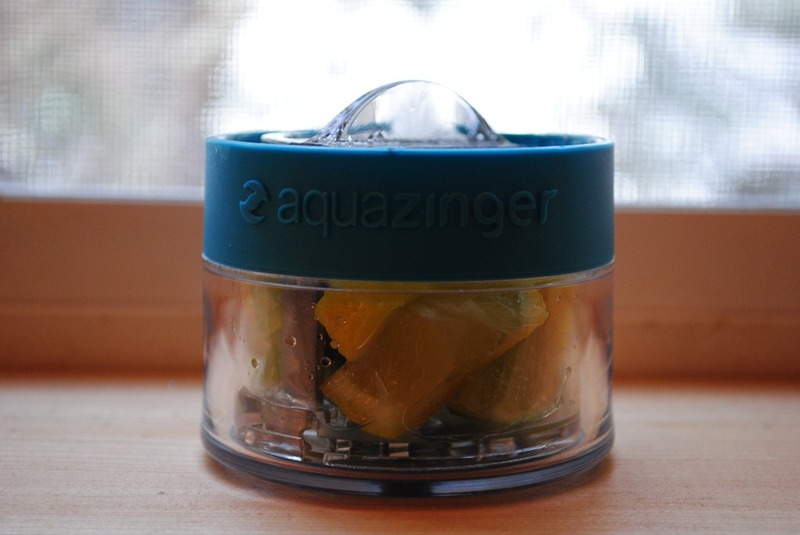 The fine folks at Zing Anything have kindly offered up one Salad Zinger to a Test Kitchen Tuesday reader. As usual, I’m doing this giveaway as a random drawing to make it fair for everyone. 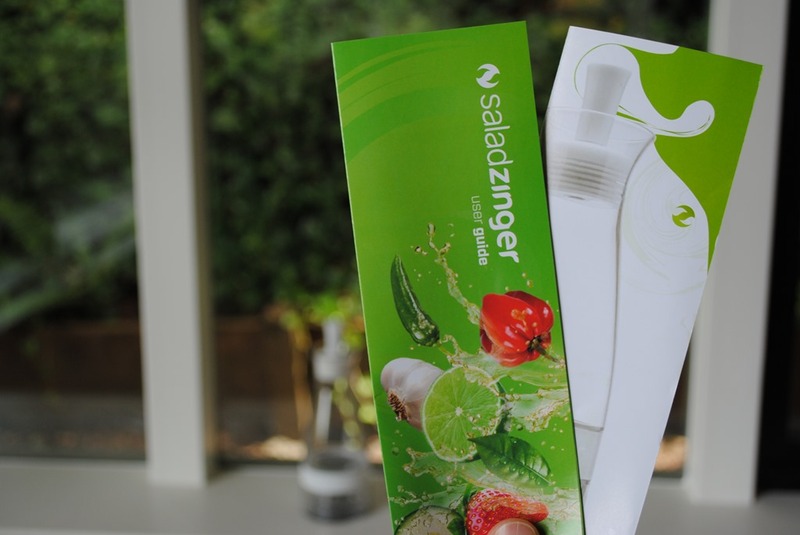 To enter, simply leave me a comment below with your favorite salad dressing recipe, or, what you would make with the Salad Zinger if you won it. I’ll draw a random winner using Random.org next Monday, August 26 at 8 a.m. PST. Good luck! I was sent a complimentary Salad Zinger for the purposes of this review, but all thoughts and content are my own and not at all influenced by the maker. 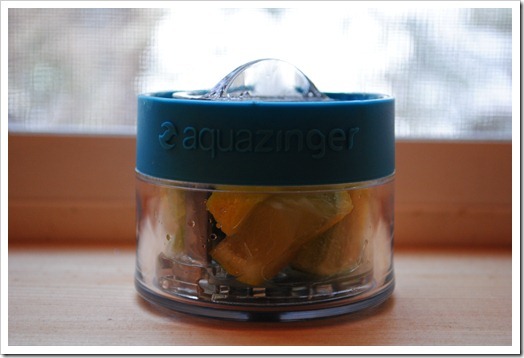 If you found this review helpful and decide to purchase a Salad Zinger, using this link from Amazon.com helps support the site and future product reviews. Thanks for reading! I am going to get a reputation, I know it. Trust me, contrary to what it might seem, I don’t live on protein powder alone. But, I do like to try different brands when I re-order in my quest to find the best protein powder. I like to add protein (and fat) to my smoothies to up the nutrition a bit and make them have staying power. One scoop (about 20 grams of protein) a day is my limit. I’ve been using Plant Fusion for a couple of months now, and it is by far, hands-down, my favorite plant-based protein powder yet. It blends well like whey, but is dairy and soy-free. I’ve tried the unflavored and vanilla bean, and like them both for different reasons. Unflavored is great when I don’t want to influence the taste of whatever I’m making. Vanilla is nice when I’m making something that I want to slightly flavor. So, how do I find all these new protein powders anyway? Well, I just search “plant protein” on Amazon, and see what pops up. If anything new strikes my fancy, I research its ingredients, and if they’re good, I order up a container and try it out. 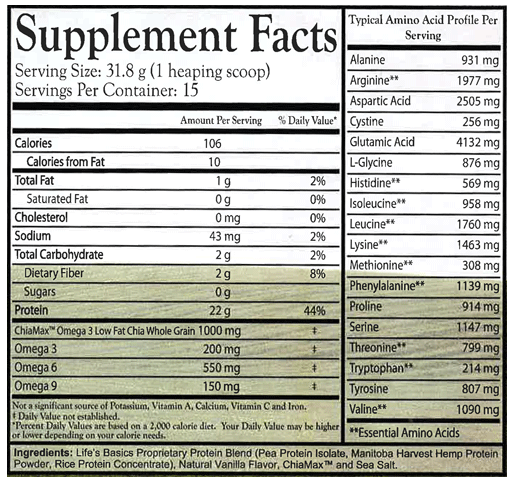 The days of going to the GNC and trying to figure out what’s best for you are long over. You can get better quality supplements on Amazon and shop in the convenience of your home with no sales pressure. 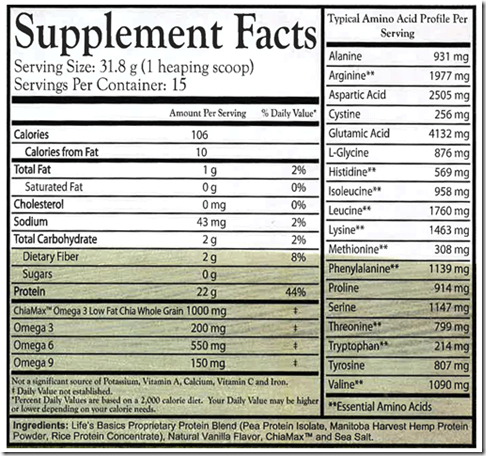 The ingredients of Plant Fusion stack up, and it has a nice range of amino acids. My only beef is that it is a bit high in sodium, in my opinion. 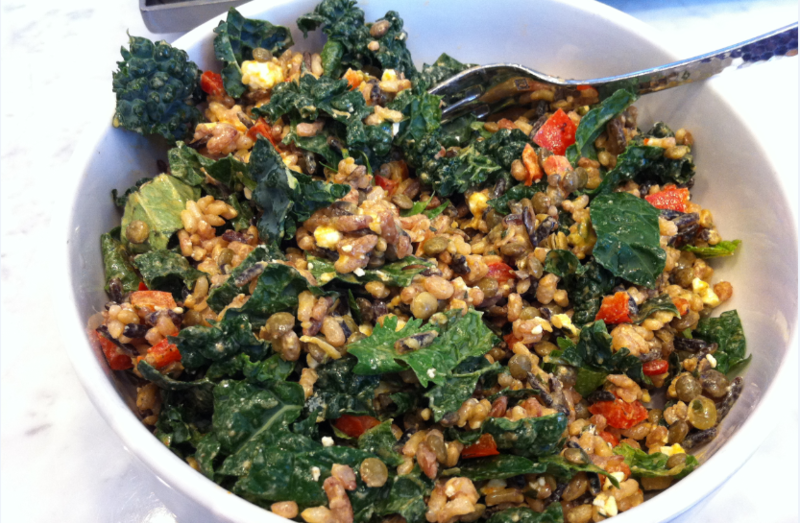 This is the case with a lot of plant proteins, including the more well-known ones like Vega. But, I eat a generally low sodium diet, so one serving a day doesn’t really impact my salt intake much. 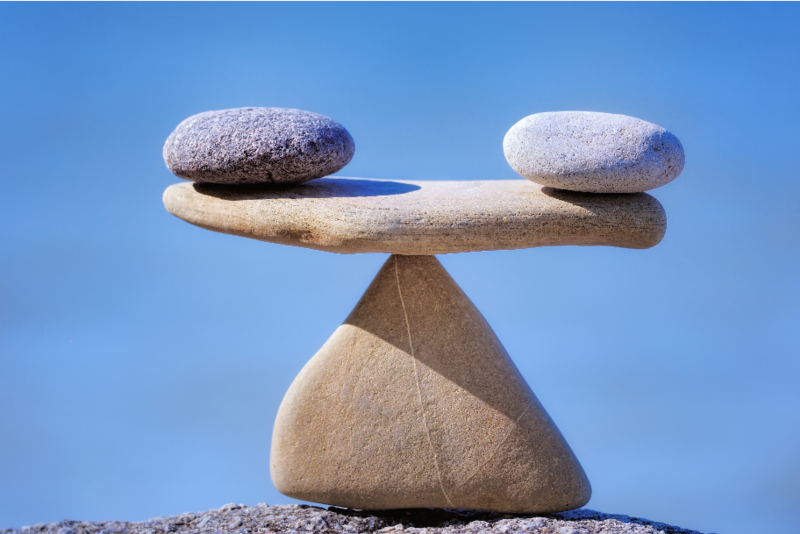 Some will argue that whey protein is more bio-available than plant protein, but, for the many of us out there with a dairy or whey sensitivity – or who just plain avoid dairy – that is not an option. Also, having now learned about the process for making whey protein, it’s not something that I really want to put in my body! Plant Fusion has a great website that explains each type of protein they use and why, you can check that out here. And, there you have it, my latest find! 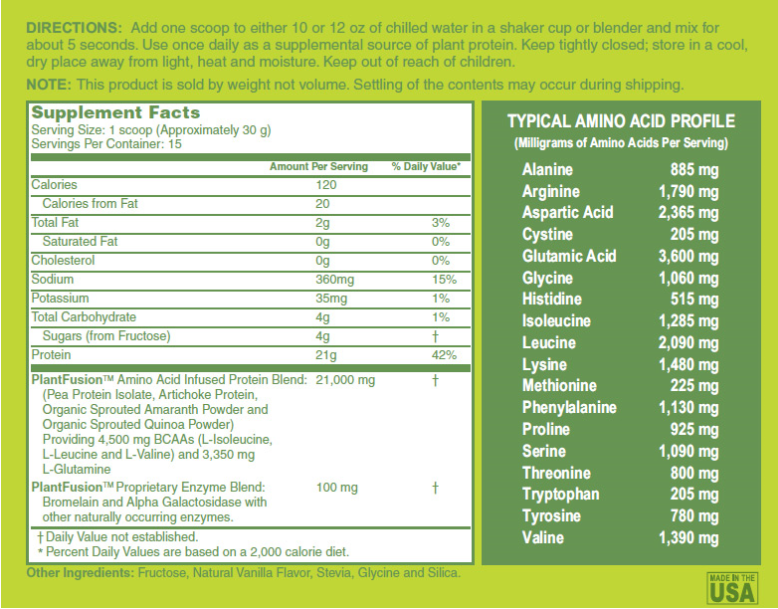 A while back, I told you about Oriya Organics protein powder that I had stumbled upon, and have been loving! I have been using that and alternating with this Lifetime Life’s Basics Protein Powder. I have to say, I like them both. 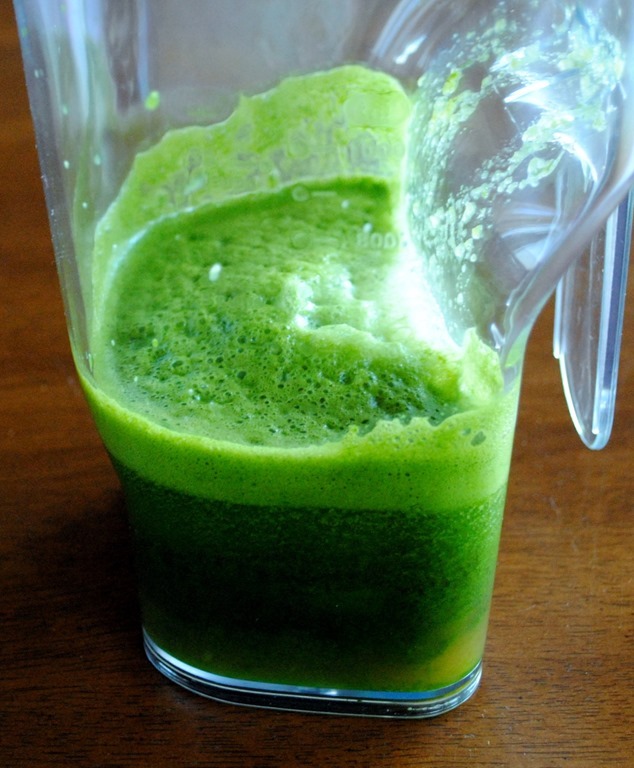 The Oriya has a green tinge due to the Chlorella and Spirulina, so I usually only use it in green smoothies. This powder doesn’t really have a “color,” per se, so it doesn’t change the look of whatever you may be adding it to. People often ask what protein powder I use since a lot of my recipes call for it. The honest answer is I’m almost always trying something new. I like to experiment, try new things, and report back to you guys when I find something I like! I scour Amazon and try things that strike my fancy. I will be keeping this one as well as the Oriya in my rotation for a while, though. I enjoy them both that much! I pretty much only use protein powders in smoothies after a hard workout, so I almost always blend it up with some fruit. This acts as a sweetener, and I love that this powder doesn’t have any added sweetener. If you are going to drink it with just milk or water in a shaker cup, you may want a sweetened variety. They make a few flavors: Vanilla, Unsweetened Vanilla, Chocolate, 5 Fruit Blend, and a Greens powder, so there is probably something for you amongst that lineup. 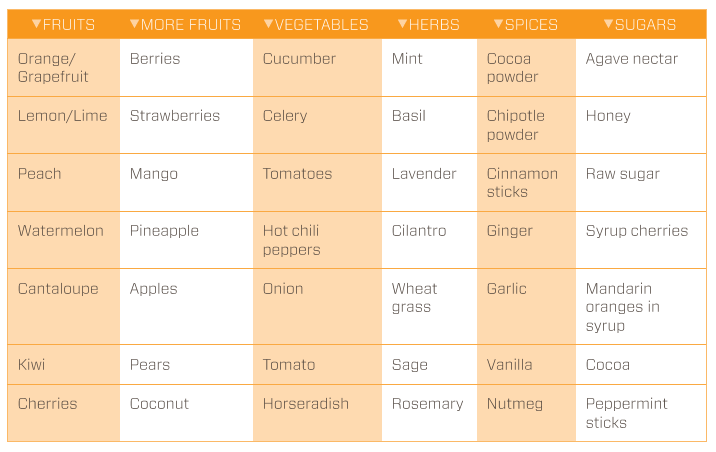 If you choose a sweetened variety, each serving has 2.67 grams of sugar from Xylitol. For what it’s worth Xylitol is actually a pretty good sweetener that is okay for you (just don’t let your dog have any – it is toxic for dogs). My only complaint is that the serving size is a fairly large scoop (about 1/4 cup), which means if you are mixing it up in a single serve blender cup, it takes up a significant amount of room. However, that is something I overlook because it’s tasty, low on ingredients and artificial-sweetener free! Bottom Line: I like this powder. It is low on ingredients, but those it does have are quality. It tatses good, and at $1.49/serving, it sports a reasonable price for such high quality. If you prefer a sweetened variety, the cost is less, about $1.16/serving. Eyeing a protein powder you want me to check out? Let me know in the comments and I’ll give it a whirl! A couple of weeks ago, I ran out of the SunWarrior Warrior Blend protein powder I’d been using. It took quite a long time to use up a 2.2 lb bag (months of daily smoothies), but I finally came to the last scoop. After initially not liking the SunWarrior, I ended up liking it just fine in the end. However, I like to try new things, and as it turns out, the day I was looking for a new powder, I saw a blog post on Choosing Raw that mentioned Oriya Organics. I did a little quick research of my own and ordered up some of the Superfood Protein Medley. The powder is cold-processed, and I appreciate that they took the effort to sprout the brown rice and chia seeds to make them more digestible. It also includes both Chlorella and Spirulina, which have health benefits in their own right, but most people aren’t likely to seek out individually. 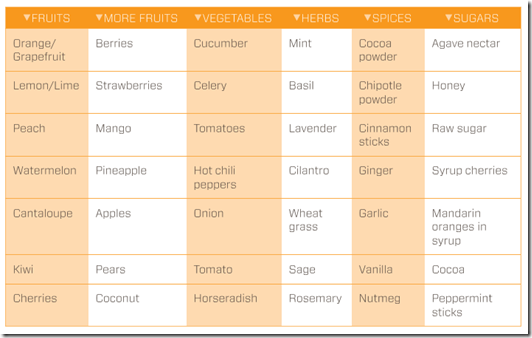 I recently found out I have a sensitivity to artificial sweeteners (including Stevia, so the SunWarrior would be out anyway as it has Stevia), and I need to avoid them for a while. This has no sweeteners, “real” or otherwise. Bonus! 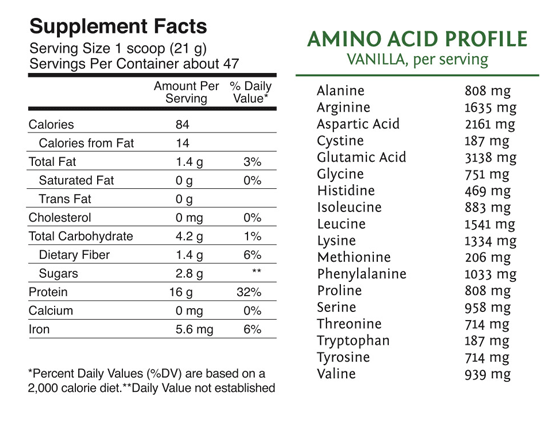 On a side note, if you take a look at your favorite protein powder, is it high in carbs and sugar? So many “off-the-shelf” protein powders are packed with fillers and sweeteners (often artificial) to make them palatable, so that is something to look at when selecting which powder is right for you. 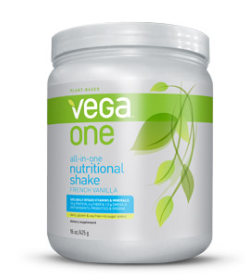 On a second side note, if you are looking for a protein powder that is nutrient dense with only one ingredient, my favorite go to is still the Omega Nutrition Pumpkin Seed Protein. I have primarily used the Oriya Superfood Medley protein in my morning smoothie. 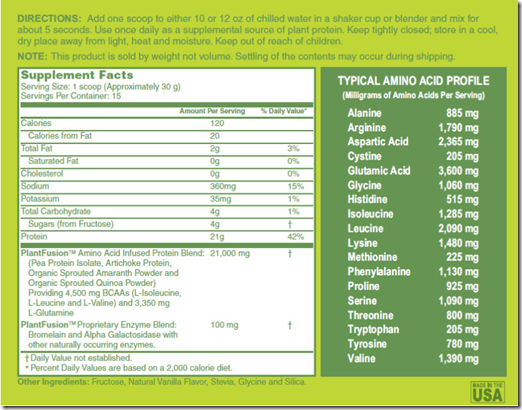 If you are green-averse, you may not dig this, as the Chlorella and Spirulina make the powder green. However, if you can get past the initial color, it blends well, has a neutral taste, and adds a nice punch of protein in your breakfast shake. Bottom line: I like this powder. It’s a little on the pricier side, but this is a case of “you get what you pay for” due to the higher quality, cold-processed ingredients A 24-serving container will set you back about $44 with $4.99 shipping, or, about $2 per serving. For the budget-minded, something like the aforementioned pumpkin seed powder may fit the bill more, as it has 40 servings for around $20, or, $.50/serving. I am eating a little crow…errr…protein here, and wanted to let you know that after consuming the entire 2.2 lb bag of this protein, I actually ended up really liking it. Funny how that goes. Either my palate adjusted to liking it, or, I just figured out what flavors to mix it with to make it taste better, but, I have to take back a lot of what I said! I’m leaving the review below intact, because this was my true first impression, but, couldn’t live with myself for not coming back and letting you know I changed my mind. 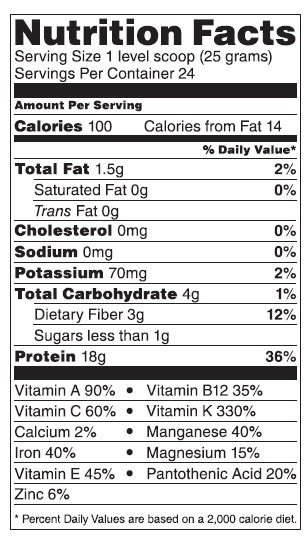 I really do like the nutritional profile of this powder, and 2.2 lbs lasts a long time, so I can imagine I will order it again in the future. 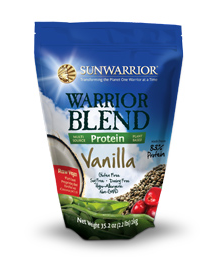 I have been trying to write up a Sunwarrior Warrior Blend Protein Powder review for a couple of weeks now, and I just haven’t been able to bring myself to do it. I guess that says a lot, huh? I really want to like this powder. 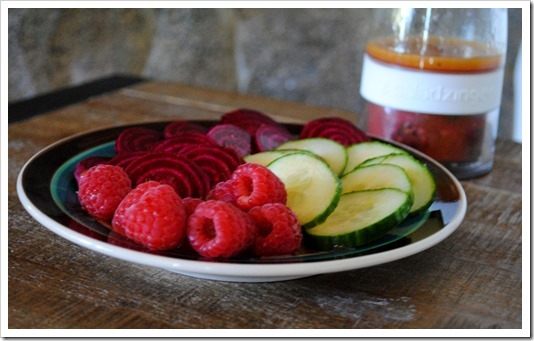 It has a great nutritional profile, it’s low in sugar, and it’s totally raw and plant-based. 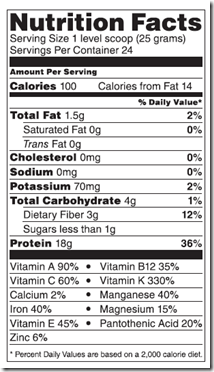 I mean, look at this nutrition panel – it’s totally awesome! 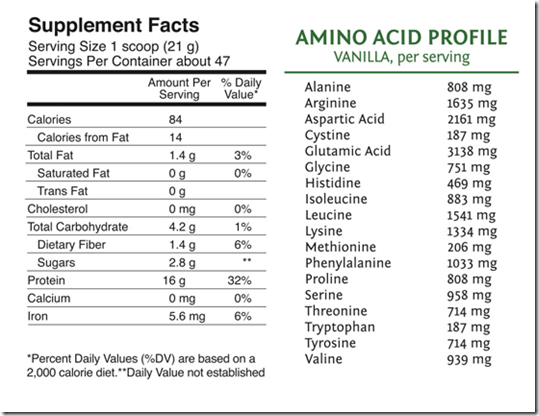 Low calories, high protein, and a huge amino acid profile. And, the ingredients are fairly good: Sunwarrior Proprietary Protein Blend (Raw Organic Cranberry Protein, Raw Pea Protein, Raw Organic Hemp Protein), Natural Fibers (Fenugreek, Konjac, Guar), Organic Vanilla, Organic Stevia, Medium Chain Triglycerides. I’m not so crazy about the “natural fibers,” but I’m assuming those help with dissolvability. But, after trying it for a while now in various ways, I just really am kind of “meh” on it. Though it dissolves well, the taste is a little too fake-earthy for my earthy tastes. I don’t know what it is, honestly. But there is something weird about the taste that I can’t seem to get past. I generally like “earthy.” I really like the Garden of Life Raw Protein, which is pretty darn earthy, but there is something not right about the “earthiness” of this powder. I don’t think it’s the Stevia, but I can’t be sure. In general, the powder seems to “work,” in that it helps keep me full and doesn’t cause GI distress. The cost is moderate – about $40 for 47 servings – and while I don’t mind paying for quality, the taste is just off-putting enough to make me try something different. I had pretty high hopes for this powder, as it is raved about across the foodie blogosphere, but I don’t see myself buying it again. I’m not sure if it’s because I bought the “Warrior Blend,” vs. their traditional protein powders, but I am just not really digging the taste of this one. What do you think? Have you tried it? Do you like it? Am I just missing the boat on this one?! 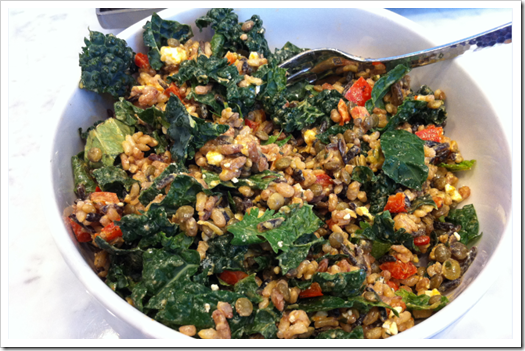 Last week, I ran out of the Amazing Grass Amazing Meal I have been taking daily, and headed over to Whole Foods to replace it. Without a finished kitchen in sight, I am still relying on nutritional supplements to cover my bases – and honestly, if you pick the right ones, that’s not a terrible option. I debated between the Vanilla Chai and the French Vanilla flavors, ultimately settling on French Vanilla. And, it was a good choice. The flavor is really quite good, especially considering what’s in it. 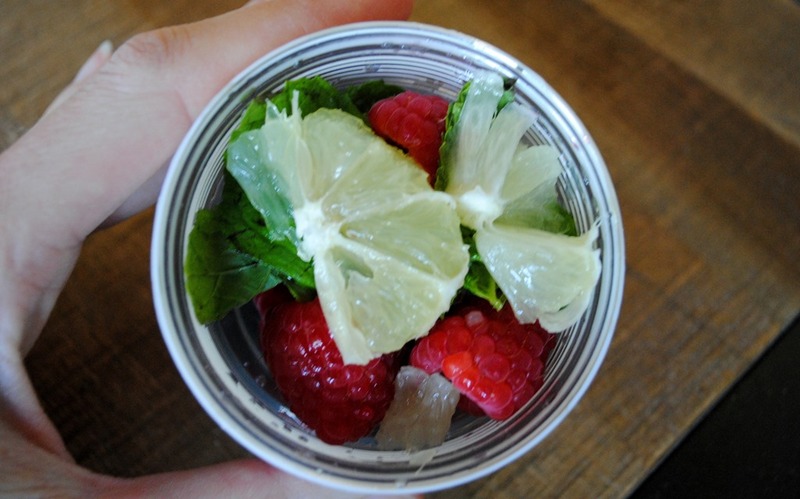 In fact, I think you could mix this up and give it to a child without them realizing they were drinking something healthy (except that it is green in color – you would have to sell that aspect or put it in a solid bottle). 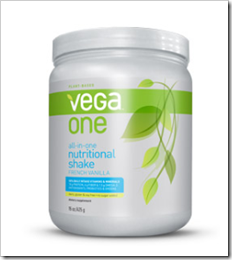 For those that don’t know much about Vega, it’s the company of vegan ultra-runner/Ironman Triathlete Brendan Brazier. 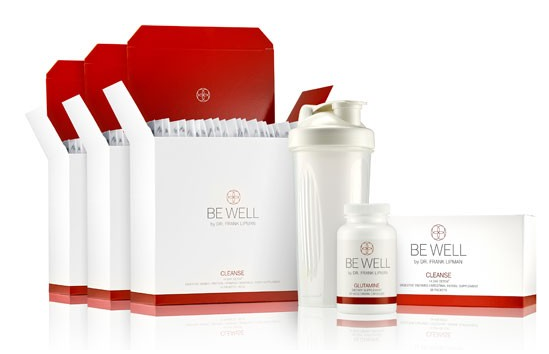 They make a line of vegan supplements, including protein powders and other nutritional powders. The nutritional shake powder has a great profile, including 15 grams of plant-based protein, 1.5 grams of Omega-3s, 1 billion probiotics, 6 grams of fiber, 3 servings of greens, and enough antioxidants to equal 2.7 cups of blueberries. That’s a lot of “punch” in a little package of only 135 calories. 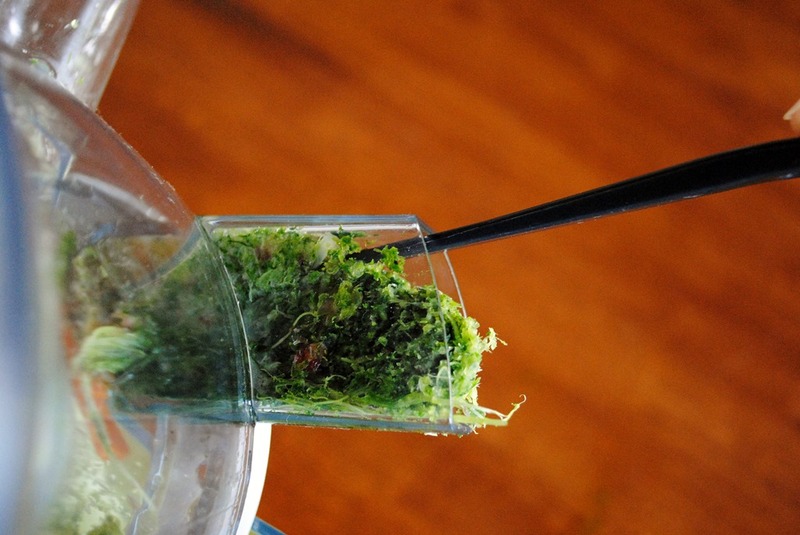 One of the things to think about with plant-based powders is their ability to dissolve in liquids. Some are good, some are not so good. This powder is really good, and doesn’t require blending in a blender. I just mix it in my Blender Bottle with 8 ounces of coconut milk beverage and off I go! Overall, I really like this powder. 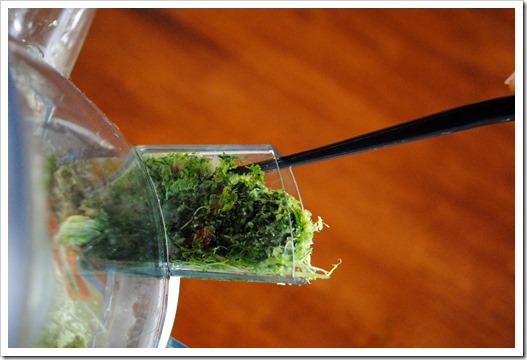 I don’t know that I will switch permanently from the Amazing Grass – but when it is on sale, I will definitely pick some up!